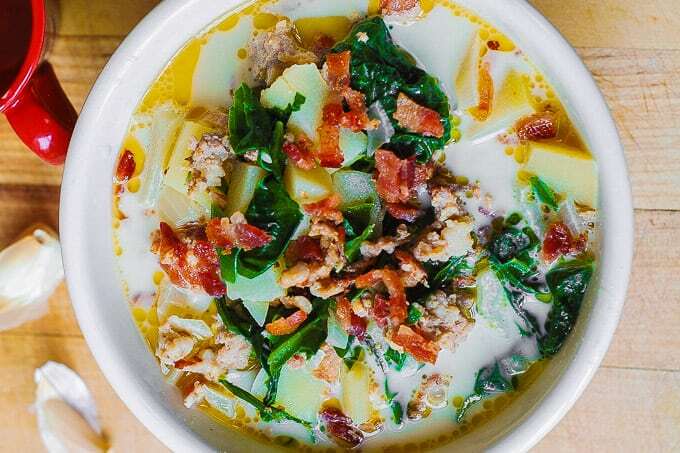 Delicious Olive Garden’s Zuppa Toscana Soup (copycat recipe) made with Swiss Chard, Italian sausage (bratwursts will work too), potatoes, and bacon. 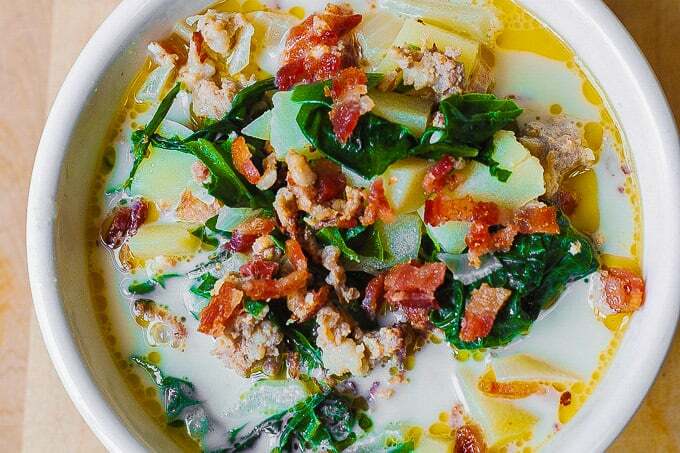 Zuppa Toscana means soup in the traditions of Tuscany, Italy. 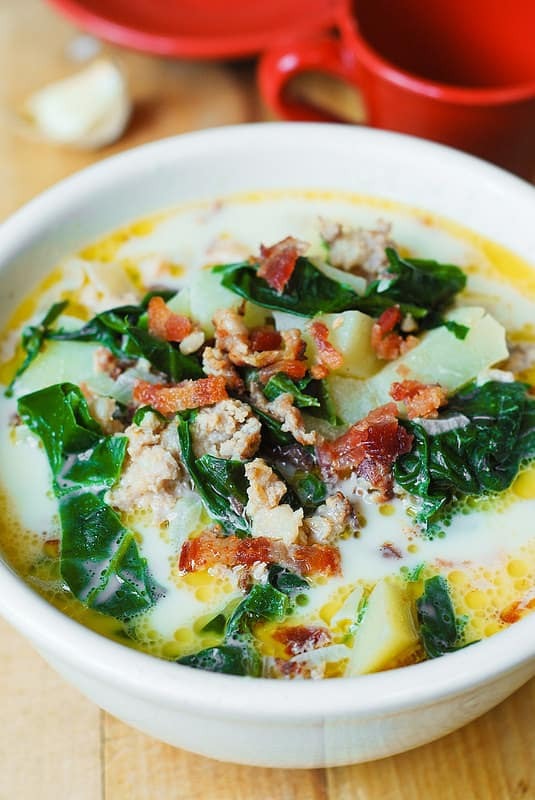 This version of Zuppa Toscana is made in one pot, and the soup takes only 40 minutes to make (including the idle time while everything is simmering)! This soup is usually made with kale, but in this recipe I use Swiss chard instead which works beautifully! Use Italian sausage or bratwursts. Use Kale or Swiss chard or spinach. Use bacon or prosciutto or pancetta. Use heavy cream or milk or half-and-half. The cooking process is very simple: everything is done in one pot! First, you cook the sausage with onions, then add water and bring to boil. Next, add potatoes and garlic, and simmer until potatoes are soft, about 15-20 minutes. 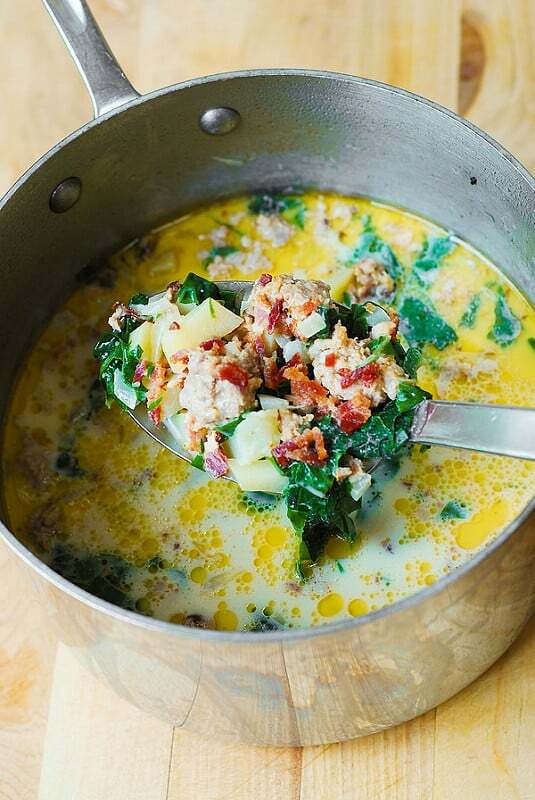 Finally, add Swiss chard, bacon, and half-and-half. That’s it! Serve in individual bowls, topped with the remaining amount of chopped bacon on top. 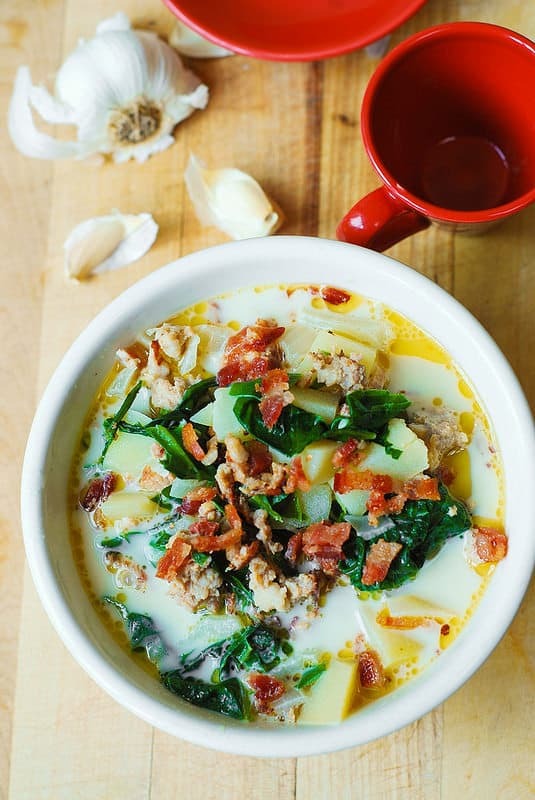 This Zuppa Toscana Soup tastes even better the next day, or two and even three days later, after being refrigerated, which allows all flavors to blend in. Enjoy! 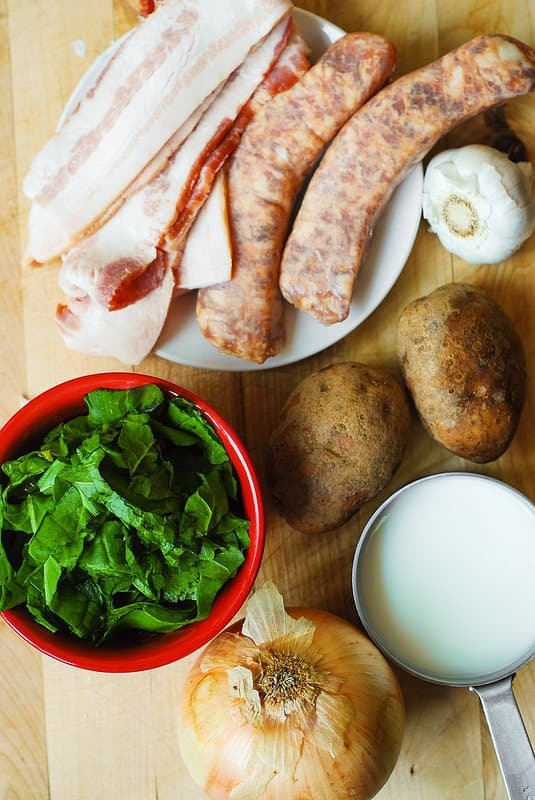 Delicious Olive Garden's Zuppa Toscana Soup (copycat recipe) made with Swiss Chard, Italian sausage (bratwursts will work too), potatoes, and bacon. Made in one pot, the soup takes only 40 minutes to make (including idle time while everything is simmering)! Chop uncooked sausages into small slices. Heat olive oil on medium heat in a soup pot, add chopped onions and chopped sausage and cook until both onion and sausage are cooked through. Add 5 cups of water to the pan, stir, and bring to boil. Add potatoes (peeled and cubed into small chunks), and minced garlic. Bring to boil, then reduce to simmer. Cook until potatoes are done, about 15-20 minutes on low simmer. Hands down, this is the BEST soup I’ve ever made!!! It is perfect! My husband has talked about it for weeks. He invited family over to try it , he is in love with it that much! Thank you , thank you! You are very welcome! Your comment made my day! So happy to hear your family enjoyed this soup! You’re very welcome! So glad you liked it! Your addition of hot sausage sounds delicious! My husband and I ate the entire soup in 2 days. I’m a soup and cracker girl but this didn’t need any crackers. I was surprised how flavourful it was just using water. I did add a lot more Swiss chard. We can’t keep up to it in the garden. Thank you, upped the bacon just a bit but one of the best soups i have ever made! Just came across this recipe, hope its not too late for a response. My question is, since I just made a pot of turkey stock, can I use that instead of water or will that change the overall taste too much? Oh and as for the sausage, do you think spicey is ok or is this better with mild? I’m sure its a preference but again, I don’t want to change the overall taste of this apparently awesome soup recipe!